The city of Meshed is one of Iran’s oldest cities, located in the Khorassan province in the northeast corner of Persia. Geographically, it is situated far apart across the great desert from the densely populated western region of the country where the great mass of antique Persian carpets were traditionally produced. Therefore, until the early part of this century, its weaving was relatively unaffected by domestic artistic trends, and, of perhaps even greater importance, was less influenced by the demands of the European market. Meshed carpet weavers have traditionally produced grand carpets of relatively fine weave, sometimes in sizes ranging to palace size. 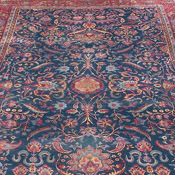 One distinguishing feature found in many Meshed antique carpets is a range of distinctive blue-red tones from deep rose to rich wine to cranberry, created by adding small amounts of indigo to the madder red dye bath. These regal reds are often complemented by a wide palette of delightful, deeply saturated naturally-dyed colors. In the finest Meshed antique rugs, a high quality, lanolin-rich wool is used, which carries a highly silky luster and provides increased longevity, even with many decades of high-traffic use. Meshed is famous for its master weaver-designers and their family-operated weaving manufactories. 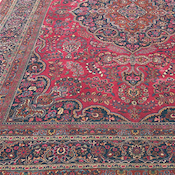 During the 1900-1940 era, there was a dramatically increased production of fine Persian carpets in patterns and colors designed to appeal to domestic and international markets. 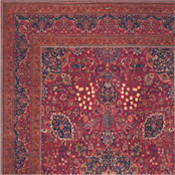 This could not have occurred without the growth of a number of important professional Oriental carpet designers in this area. 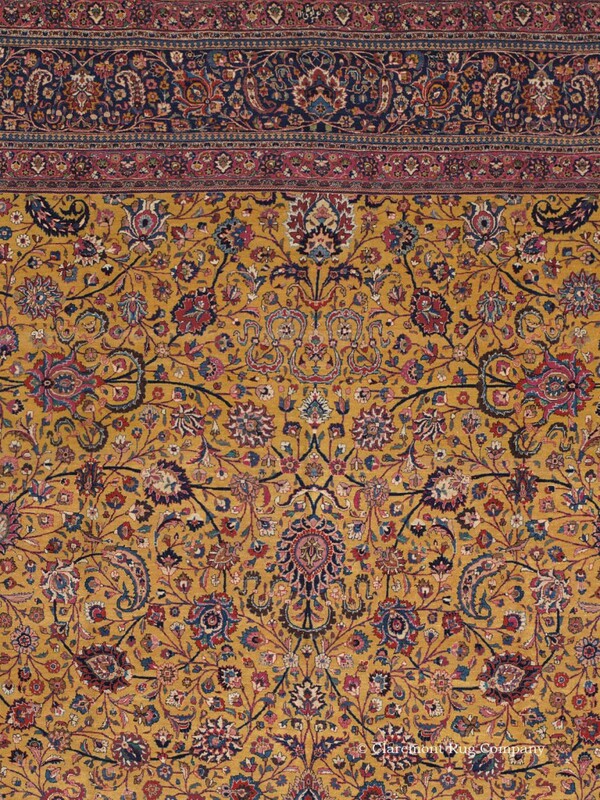 The singularly famous master weaver was Emoghli, who perfected finely knotted masterpieces with spiraling vines, scrolling floral latticework, radiating palmette medallions and a wide array of precisely rendered original interpretations of classical Persian carpet designs. His incomparable skill earned him a number of illustrious students who carried on his impeccable tradition into the 1950’s. 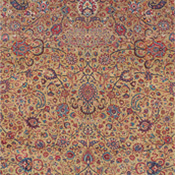 The most notable student of Emoghli was Saber, whose workshop produced a small quantity of extremely fine antique carpets on commission to prominent patrons, which usually employed a particularly luminous wool quality, deeply saturated, naturally dyed colors and highly inventive designs. 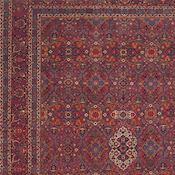 Among connoisseurs, Saber’s work is respected for its artistic inspiration just as Emoghli’s Persian carpets are enamored for their unsurpassed refinement. As in the other central regions for urban weaving, Meshed produced a great quantity of handsome yet not especially noteworthy Oriental carpets for the Western market, beginning in the 1920’s. 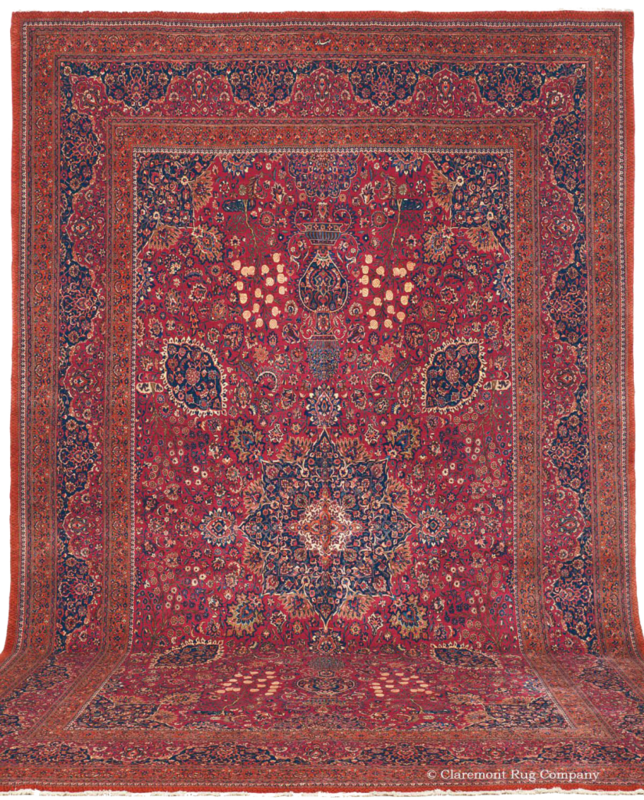 However, the finest pieces woven from the mid 19th century into the 1930s, often produced in the nearby town of Dorasht, are among the most distinguished of all classical Persian carpets, valued for their great decorative impact as well as their investment potential.